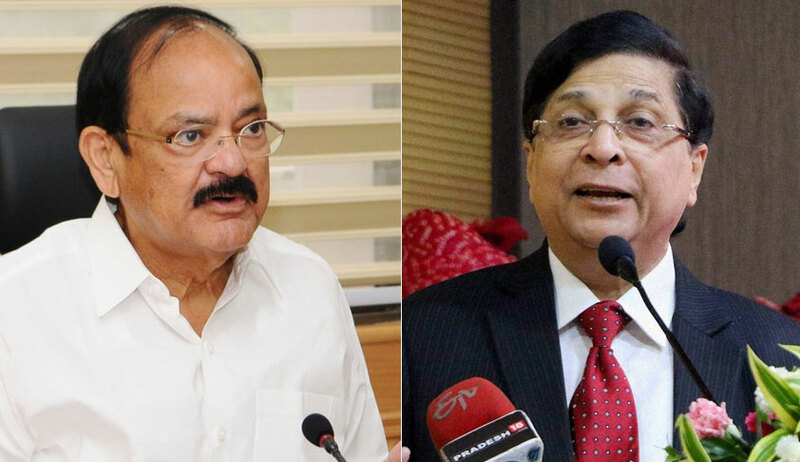 Vice President of India Mr. Venkaiah Naidu on Monday rejected the impeachment motion against Chief Justice of India Dipak Misra, opining that the Members of Parliament (MPs) who had signed the motion were "unsure of their own case". At the outset, Mr. Naidu referred to the judgment in the case of M. Krishna Swami v. Union of India to examine whether the allegations would amount to a case of "proved misbehavior" under Article 124(4) of the Constitution of India if every statement in the Petition is believed to be true. The order mentions that Mr. Naidu held consultations with several legal luminaries, constitutional experts, former Secretary Generals of both houses, former law officers, law commission members, and eminent jurists. It then notes that all such experts almost unanimously opined that the present motion was not a fit case for removal of a judge. Mr. Naidu goes on to examine the language used by Article 124 (4), to note that it uses the expressions, "proved misbehavior" and "incapacity". He then opined that the use of the prefix "proved" mandates actually proving the misbehavior before the parliamentary procedure for removal of a Judge can come into play. He, thereafter, noted that the phrases used in the motion indicated that there existed a "mere suspicion, a conjecture or an assumption", which did not constitute proof beyond reasonable doubt, which was required to make out a case of "proved misbehavior" under Article 124(4). Mr. Naidu added that conversations between third parties "with dubious credentials" cannot constitute any material evidence against the CJI, seemingly referring to the allegations against the CJI based on a transcript of purported conversations between three accused persons in the medical college bribery case. Curiously, the order also refers to the Supreme Court's judgment in the case of Kamini Jaiswal v. Union of India, which forms the basis for the second ground for impeachment as proposed by the MPs. The motion had submitted that the manner in which the CJI dealt with the Petitions filed by Advocate Kamini Jaiswal and the CJAR "clearly violates" the Code of Conduct for Judges. The two Petitions had been filed demanding an independent probe into allegations of corruption in the higher judiciary. To this end, it had referred to the unprecedented drama fuelled at the Supreme Court in November last year, with the Court annulling an order passed by a two-Judge Bench, after a rather forthright confrontation between the CJI and Advocate Prashant Bhushan. Mr. Naidu relied on this judgment to assert that this was an "internal matter to be resolved by the Supreme Court itself", observing, "Going through the five allegations mentioned in the Notice, I am of the view that they are neither tenable nor admissible. The allegations emerging from the present case have a serious tendency of undermining the independence of judiciary which is the basic tenet of the Constitution of India. Considering the totality of facts, I am of the firm opinion that it is neither legal nor desirable or proper to admit the Notion of Motion on any one of these grounds." He further opined that the allegations in the motion either concerned internal judicial processes or were "unsubstantiated surmises and conjectures which hardly merit or necessitate further investigation". Besides, he emphasized on the fact that while examining such a notice against one of the senior most constitutional functionaries of the country, one should examine all factors "very carefully and dispassionately", because initiation of such proceedings "tends to undermine the faith of the common person in the judicial system". He added, "In the absence of credible and verifiable information placed before me which gives an indication of 'misbehavior' or 'incapacity', it would be an inappropriate and irresponsible act to accept statements which have little empirical basis. As heirs to an illustrious democratic tradition and custodians of the present and future of democratic polity, we should in my view, collectively strengthen and not erode the foundations of the grand edifice bequeathed to us by the Constitution makers. We cannot allow any of our pillars of governance to be weakened by any thought, word, or action." Lastly, Mr. Naidu asserted that well established parliamentary customs and conventions, as have been mentioned under Paragraph 2.2 of the Handbook for Members of Rajya Sabha, have been disregarded. He pointed out that the provision prohibits publicity of any Notice submitted by a member till it has been admitted by the Chairman and circulated to the members. However, in the case at hand, the MPs had addressed a press conference soon after submitting the notice to Mr. Naidu, and had shared the "unsubstantiated charges" contained in the motion. This, he opined, was "against propriety and parliamentary decorum as it denigrates the institution of CJI".